If you’ve ever played golf—or seen people playing golf—you know that there isn’t just one type of club. Each club serves a different purpose, depending on where the golfer is on the course. When we think about acupuncture, needles are much the same. There are many different types, of varying thickness, and flexibility, that are designed to treat the patient in different ways. The most common acupuncture needle is called a filiform needle—meaning threadlike. Usually these acupuncture needles range in length between 30 and 40 MM and typically can be between .1 and .25mm in diameter or for discussion let’s call it thick. Most of what I use are .16mm thick. For reference, an average piece of hair is .08mm thick. At this thickness, you don’t bleed when the needle is inserted or removed—it’s too thin! These needles are usually made of stainless steel, which is tough material that can bend and still remains sharp. Usually, these needles are placed in a plastic tube. The tube allows the practitioner to hold and target the needle to the acupuncture point, then tap it down the tube into the skin quickly but gently. When inserted effectively, acupuncture becomes less painful because the needle quickly passes the pain-perceiving nerve cells on the top most, superficial layer of the skin. Needle insertion depth varies according to the style of acupuncture practiced. My insertion depths typically vary between a few millimeters up to about 5 millimeters or about ¼ inch. However, these needles don’t necessarily need to be inserted. In fact, the Shakuju Therapy needle, which is .2mm thick, is rarely inserted. It is specifically designed with an oval point, so as to not to cause discomfort when the skin is touched by its point. In Shakuju Therapy, we use a particular type of needle that’s called a Teishin needle, specifically designed for this style of acupuncture. This needle is thicker than a filiform needle and has a blunt tip. Teishin needles are only meant to stimulate acupuncture points on top of the skin (or on the ear). While used less often at Gracey Holistic Health, there are other types of needles used for more specific purposes. 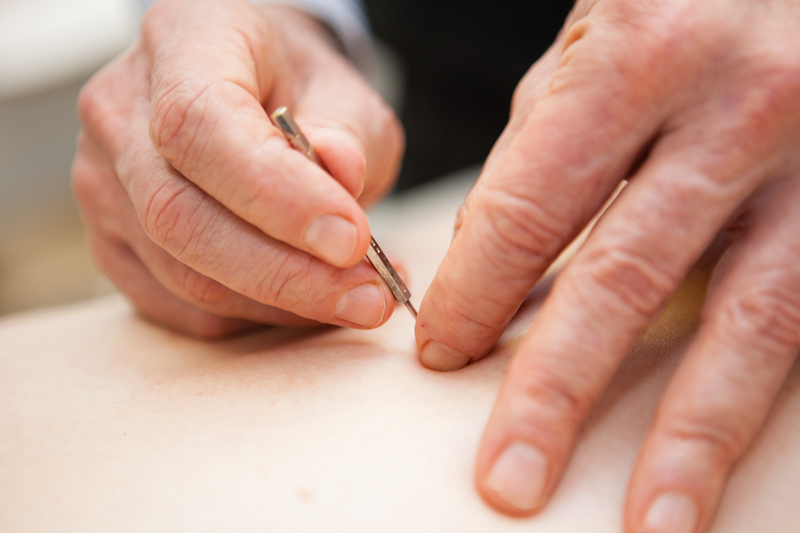 Intradermal needles and press tacks are very short needles and even thinner than most filiform needles. They are typically used on sensitive parts of the body where minimal needle penetration is needed (like the ear) and other parts of the body. They are kept in place by adhesive cover to extend the treatment for a number of days. The seven star needle is an arrangement of seven filiform needles, used by tapping quickly to stimulate a important acupuncture points or areas of the body. At Gracey Holistic Health in Boston, we can show you the different types of needles used in your treatment. There’s nothing mystical. There’s nothing to be scared of. It’s just another tool used to help you on your way to health.